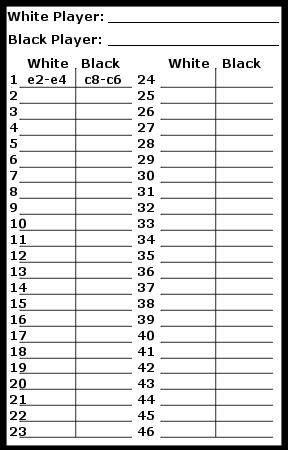 Taking chess notation occurs when a player writes down his or her moves using the coordinates alongside the chess board. In the diagram above, you can see the X in the middle of the board. This X is marking the “e4” square. The arrows show you why that square is e4 because that square lines up with the e-file and the 4th rank. 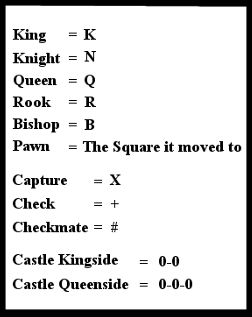 There are many ways to notate chess moves and each style has its own name and symbols. This handout will teach the simplest version of notation. The benefits of using this style of notation is that it can be taught and learned within 30 seconds to a minute making it the simplest notation system. However, it does have a major downside for any seriously competitive player: it gives you the least in-game information about the moves. then write the name of the square the piece moved to. 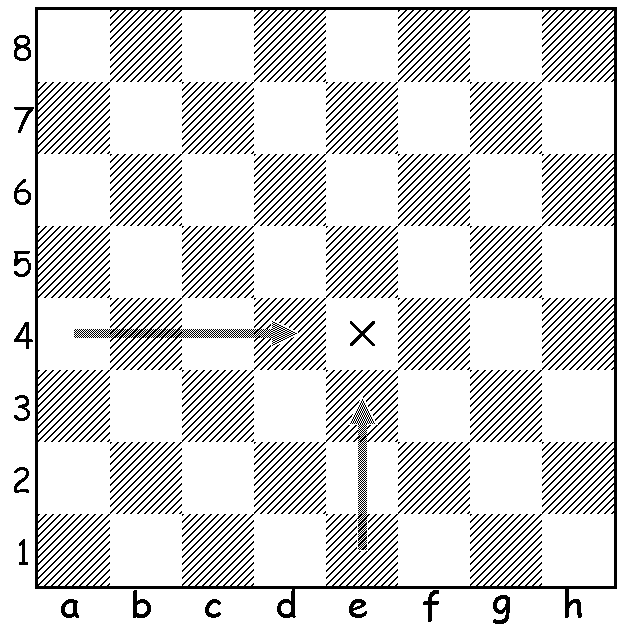 In the diagram above, the rook is on the e4 square and wants to move to the b4 square. This move would be written as e4 – b4. If it decided to move from the b4 square to the b8 square, the move would be written as b4 – b8. That is pretty much it for coordinate notation. 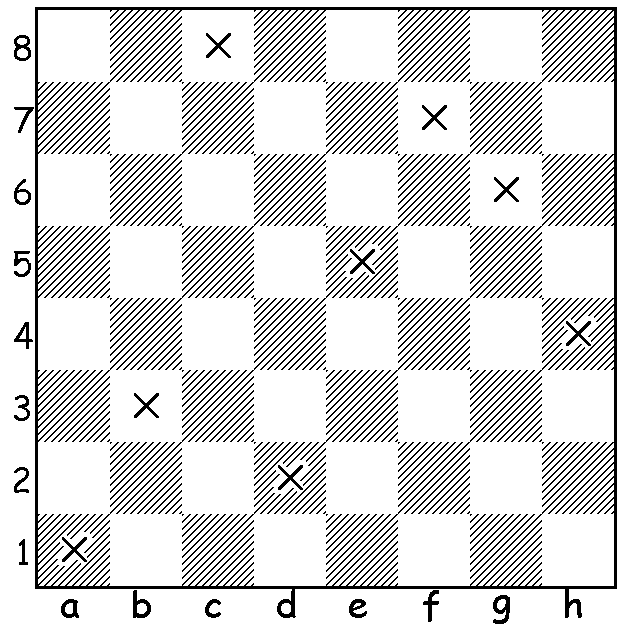 In the diagram above, there are eight Xs placed on various squares on the chess board. On a sheet of paper, try to notate the Xs as quickly as possible. You can even drop 8 pennies on the board and notate the squares they landed on for more practice. One thing to understand is you can do this on an actual chess board too, even if it doesn’t have letters and numbers on it once you get good enough. Practicing this simple skill is helpful and is guaranteed to improve you as a player. Where do I write down my moves? The picture below is a sample notation sheet. You can obtain these sheets from many different online sources. A simple search for “Chess Notation Sheet” or “Chess Notation Pad” will bring it up. When notating, you always write down who is playing the white pieces and who is playing the black pieces. Often on many notation sheets there will be additional information you can fill out such as the date, name of the tournament, your opponent’s rating, etc… But the most important information is who is playing whom. When writing notation, it is extremely important to understand that you must write down every move of the game which includes all your moves and all your opponent’s moves. Failing to write down both player’s moves would indicate you have missed the entire point of notation. There are very few things any chess coach can guarantee a player. However, one thing that can be guaranteed is that you will improve by going over your games and you can only do this through notation. In the picture, you can see that white has played 1.e2-e4 and black has played 1…c8-c6. Notice how both white and black have their own 1st move. A lot of players make the mistake of writing white’s move on the first line and then black’s move on the second line. Do not do that! You will also notice in the short paragraph above that when I wrote “1…c8-c6” that I used three dots. The reason for this is whenever you are reading chess literature sometimes the author wants to make a comment about a move. After that comment, if it is black’s move, the three dots are used between the move number and the played move to indicate it is black’s turn. If it is white’s turn, then only one dot is used. Find someone with whom you can play a chess game and notate your first game. Take your time and make sure you get all the moves written down. It will be frustrating at first and you will be distracted from the game; however, if you can notate 10 games you will have no issues from that point forward. Good luck! All serious chess players use algebraic notation as they become more competitive in tournaments. The reason is that it gives you more in-game information. The picture below demonstrates all the notation symbols to take notation using the Algebraic style. Notice that the Knight and King both begin with the letter “K” and therefore for “Knight” they use the letter “N” instead. One thing that regularly happens when using Algebraic Notation is when two pieces can move to the same square you have to denote which one moved. For example, if a rook on a1 and a rook on f1 can both move to the c1-square, you would either write Rac1 or Rfc1 denoting which rook specifically moved. 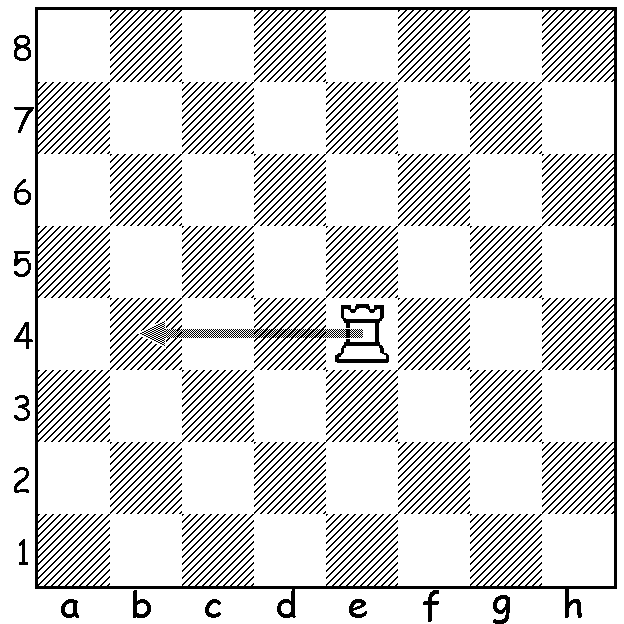 The same is true for a rook on c8 and a rook on c1: you would write R8c5 or R1c5 indicating which rook moved. The same is true when two knights can move to the same square. For example, if knights are on f3 and b1, then Nbd2 or Nfd2 could be written!